"This then is the first duty of an educator, to stir up life but leave it free to develop." The Montessori 3-6 program (often called "Primary" or "Children's House") is a place where the child continues to build himself in all sorts of new ways. Practical life activities engage children in way that builds a foundation of concentration, competence, and confidence. There are a great variety of practical life activities, so everyone finds something that appeals. Many of them look like household chores, and children love to do "real work" that they see adults performing at home and school. If adults do it, it must be important, the young child unconsciously reasons. Another aspect of practical life, which Montessori called grace and courtesy, is simply the direct teaching of how we make each other feel comfortable in any number of social situations that arise among individuals in a group. Given this opportunity, young children love to practice these social skills, which range from the simple use of "please" and "thank you" to more advanced techniques such as what to say when you accidentally disturb someone else's work or what to do when you are coughing. Another element of the classroom—which we call sensorial—helps the child discover important qualities of the physical world, name them, and classify their qualities. To us they appear as colorful and appealing puzzles; to the 3 or 4-year-old they are so much more, and that's why he repeats them over and over. Other manipulative materials offer children the beginning keys to writing, reading, and mathematical concepts. 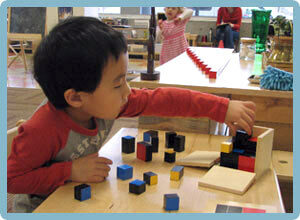 Some people know Montessori as "where kids learn to read and do math before they start school." While that is the case for many children, these skills are presented in a way that's natural for young children, and it's something they may choose to do rather than a "curriculum" they must complete at a certain age. Different children will progress to different points before they finish their years in the primary classroom, depending on their interest and their pace of development. The guide also offers storytelling, group sharing, musical and artistic experiences, movement games, celebrations, and the fascination of the natural world of animals, plants, rocks, etc. 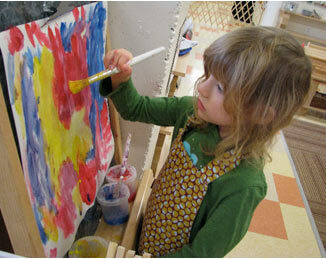 Children have abundant opportunities to use their new skills and express creativity. Their imagination is fed by the richness of the classroom environment and by introducing them to the world beyond. 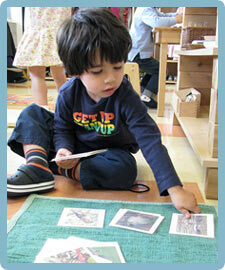 The Montessori guide takes care not to judge the children's work. Children take satisfaction from their own real accomplishments, a trait that serves them well in life, and so we take care not to train them to seek outside approval or rewards. 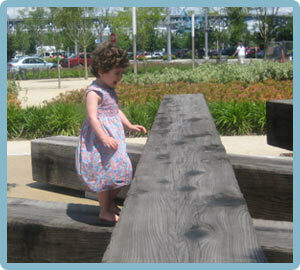 The child is free to choose her own activities from the ones that have been presented to her. Often she observes another child doing something that appeals, and she can request a lesson on it. Children advance at their own pace. We do not pressure them for achievements. Encouragement is subtle and individual. Pressure can threaten the child's budding confidence and independence. Instead, the guide watches carefully for that moment when the child is ready, or shows interest, and then she offers the work. One of the guide's leading principles is "Help me to help myself." With great precision she gives lessons on the use of new material. She assists, comforts, redirects, and occasionally restrains as needed. By her example the children learn respect for each other and for the environment. They learn new ways to express their natural curiosity and joy. The primary classroom is a three-year mixed-age group. Each child—regardless of whether he is a fast learner or a late bloomer— experiences the cycle of growth from "apprentice" to "mentor." This is of great value for all children and something they don't usually experience in traditional classes of one age, one grade. The mixed-age classroom also contributes to cooperation among the children. Younger ones learn by example of the older ones; older children have leadership opportunities, and a familial feeling grows in the primary community. 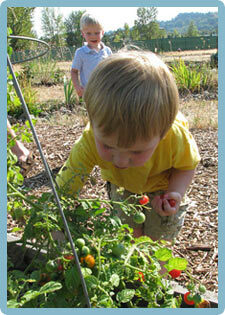 "The children experience a joy at each fresh discovery. They are conscious of a sense of dignity and satisfaction..."
Dr. Montessori observed that "work" and "play" are not really two different things for children: What adults call work is not drudgery for children, and what we call play is often equally purposeful for a child. (Witness the enormous energy and intensity that often accompanies free play.) We often use the word "work" for all activities undertaken by the child with a goal in mind, whether arranging flowers, stringing beads, drawing a picture, doing a puzzle, building with blocks, sweeping a floor, or telling a story to your friend. Because of our respect for the children's effort and concentration, many will work on an activity repeatedly until something inside tells them that this particular work is finished. Often the child will visibly demonstrate a sense of satisfaction and pleasure. This experience helps the child develop her attention span and sense of competence. Much of the activity and learning is actually indirect preparation for more familiar and formal subjects that come along during the elementary school years. This early learning arising from concentration on a freely-chosen task is the kind that lasts and grows. "The child should love everything that he learns, for his mental and emotional growth are linked."